It's been a long time since I've done a chicken update. I think the last time I wrote about them was the day we said goodbye to Almonzo, Eggs and Hamburgerpoopedonthecarpet. We had three chickens then for quite a while. 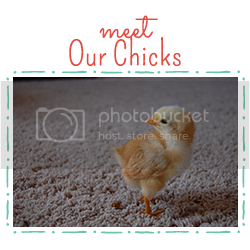 But a few weekends ago we went back to Terri, our awesome chicken lady and got three more hens. I'd like to introduce you to Zinnia, Nana and Denise. Zinna is the other black cochin. We wanted to give her a name that started with z, like the other black cochin, Zumbrota. For a while she was going to be Zeta, named after Catherine Zeta, but we chose Zinnia. And hopefully having named a chicken after my favorite flower, I will now learn how to spell Zinnia without an e. That was a bummer. Nana got her name for a few reasons. My nephew Simon told me he was a Mexican Banana for Halloween. I asked him what that looked like and he said, "a banana with a sombrero." I wanted to honor his clever costume in some way. When I told Rory he said, "well, Elsie can say Nana." 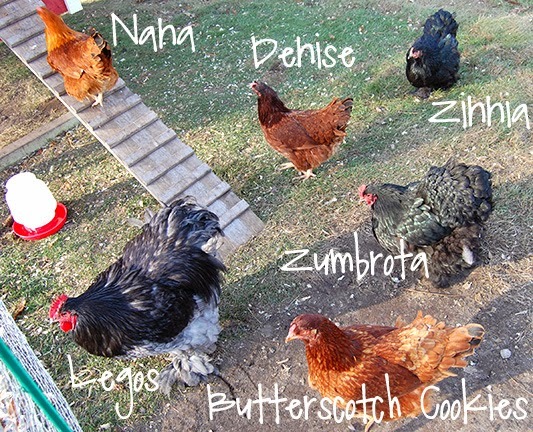 So we named a chicken a word that Elsie can say. Denise. Driving home discussing names Rory said, "How about Denise." I nearly spit my coffee. A chicken named Denise. That's just hilarious. Introducing the three new ladies to Big Rooster Legos and the other two hens has been sort of hard to watch. The animal kingdom bothers me. And though Rory tells me to stop projecting coop hardships, I can see what is happening. Legos is aggressive and rough. And sweet Zumbrota, who used to be the uncool chicken in the coop, suddenly made it into the popular clique and is rude to the new kids. Come to think of it, the chicken coop plays out a whole lot like high school cliques. We are getting two or three eggs a day, and after they are done molting, expect all five hens to start laying. Five eggs a day equals a whole lot of frittata. 'Denise' really cracks me up. No egg pun intended. Hope the drama dies down. You might want to think about doing some co-op. Shoot. Co-op in the coop! I'm on a roll here.